General Motors may have shuttered the doors of Oldsmobile and Pontiac, but on the internet, the brands can never die. Yesterday, we published a profile of Uzi Nissan and his fight with the car company over his ownership of the nissan.com domain name. That lead me to ask all of you internet users what some of the more obscure automotive themed websites were, and you didn’t disappoint. 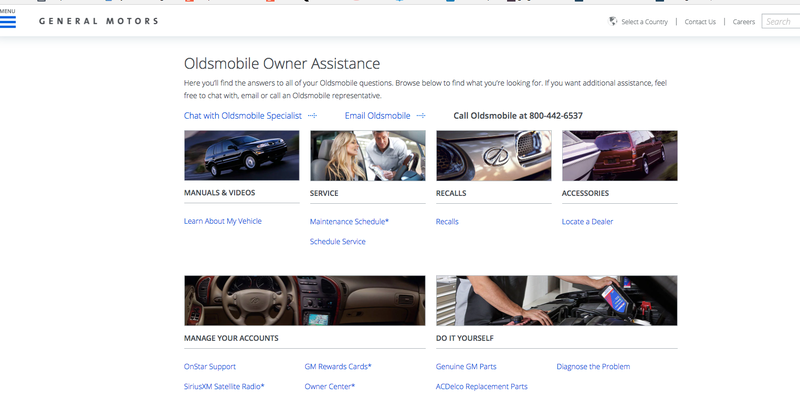 As it turns out, GM sill has support websites for both Oldsmobile and Pontiac! The brands aren’t dead after all! Beyond the initial shock of discovery, there isn’t too much else to the webpages to get excited about. An apt reflection of the later-years Olds and Pontiac brands themselves. If you navigate through the “Learn About My Vehicle” pages, you can download owner’s manuals, “get to know your car” guides and stuff like warranty information. If you get into looking up older models on the site, though, the information and resources become sparse, if not just completely nonexistent. But at least GM tried.